Nuclear physics is the part of physics that studies the nucleus of the atom. Everything on the earth is made up of atoms; they are the smallest part of a chemical element that still has the properties of that specific element. When two or more atoms combine they create what we know as the molecule, which is the smallest part of a chemical compound which still has the properties of that specific compound. Understanding the structure of atoms is key in studies such as physics, chemistry, biology, etc. Diagram of the CNO Cycle. Atoms are made up of electrons, neutrons, and protons. The protons and neutrons are in the center of the atom, which is called the nucleus. 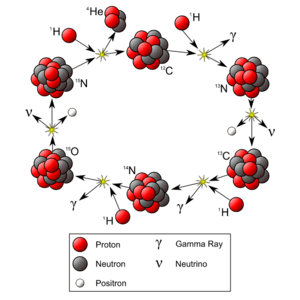 The protons and neutrons are the heaviest part of the atom and make up most of its mass. The electrons move around the nucleus very quickly, making what is called an electron cloud. The electron cloud has a very small mass, but it makes up most of the space of the atom. The electrons have a negative charge, and the protons have a positive charge. Due to the charges in the atom, that is how the atom stays together, by attraction of the electric charges present in the atom. Atoms have different features that single out one atom from another, and show how each atom can change in different conditions. These properties include atomic number, mass number, atomic mass and weight, and isotopes. In an atom there are three fundamental forces that keep atoms together. electromagnetic force, strong force, and weak force. The electromagnetic force keeps the electrons attached to the atom. The strong force keeps the protons and neutrons together in the atom. The weak force controls how the atom decays. In the early 20th century, scientists had trouble explaining the behavior of atoms using their current knowledge of matter. So to deal with this they made a brand new way to view matter and energy, and they called it quantum theory. Quantum theory explains how matter acts both as a particle and a wave. Atoms emit radiation when their electrons lose energy and drop down to lower orbitals. The difference in energy between the orbitals determines the wavelength of the given radiation. This radiation can be shown by visible light or shorter wavelengths. Nuclear physics Facts for Kids. Kiddle Encyclopedia.